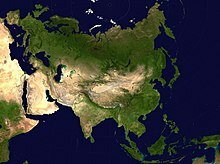 Ẹurásíà je isupoile nla to je bi 52,990,000 km2 (20,846,000 mi2) tabi bi 10.6% ojude Aye (36.2% agbegbe ile). Nigba miran o je gbigba gege bi orile kan soso, Eurasia je apapo awon orile Europe and Ásíà (Eurasia jade ninu oruko won), eyi wa latojo pipe. Eurasia je ibugbe fun 4.8 legbegberunkeji eniyan, iye to ju 71% onibugbe aye lo. ↑ "Continents: What is a Continent?". National Geographic Society. Retrieved 2009-08-22. 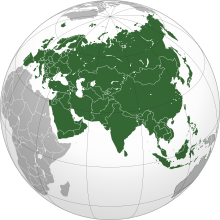 "Most people recognize seven continents—Asia, Africa, North America, South America, Antarctica, Europe, and Australia, from largest to smallest—although sometimes Europe and Asia are considered a single continent, Eurasia."